The test rig is the same as in the NH-U9 TR4-SP3 cooler review, the Threadripper 1920X, ASRock X399M Taichi, 32GB Patriot Viper 4 DDR4-3733 memory kit and Patriot Hellfire 240GB NVMe SSD for OS. Tests were performed in the same conditions so a quite high ambient temperature of 25°C. 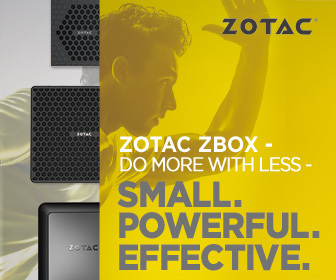 The NH-U12S TR4-SP3 can officially handle the same maximum TDP of 180W. As we already know, it can handle some more. At rated 180W, it can keep maximum temperature of out processor at about 65°C. It’s below maximum temperature specified by AMD so there are no issues at all. In the same time, we can barely hear the fan what gives perfect experience during longer work. Considering who is buying the Threadripper, I assume that more users will actually use it as workstation than a gaming PC. In this case, the processor will be more often loaded by graphics programs and anything else than popular games. This situation we can also see in our tests. Gamers can count that typical CPU temperature will be in the range of mid 50°C as in our mixed load tests. Mixed load tests base on PCMark 10 so popular home and office applications. 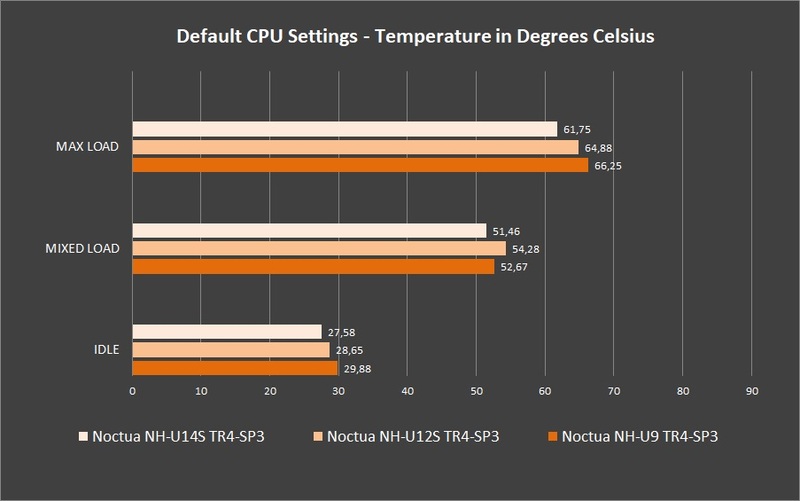 After overclocking we can see similar temperature scaling as in the NH-U9 TR4-SP3 review. Even though we’ve already exceeded the temperature of 68°C which is maximum specified by AMD, then our processor is stable. While playing games or using other programs average temperature shouldn’t be higher than 60°C so for longer work is perfectly safe. We were able to overclock our Threadripper 1920X to 4.1GHz on all cores what is a really good result. For quick tests, the clock can be higher but won’t be stable during longer, high load. I guess it’s not the matter of cooling but the CPU itself. 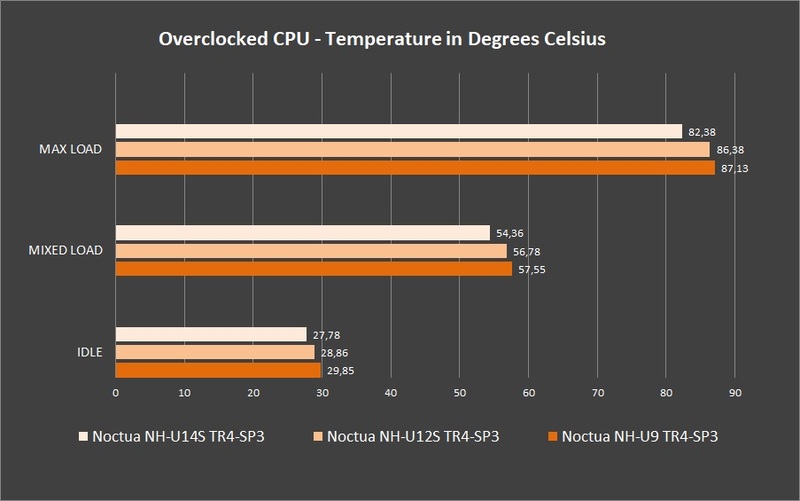 Even on the highest, Noctua NH-U14S cooler, overclocking results are about the same. One of the advantages of the NH-U12S is for sure its size. It’s the largest cooler which fits into all popular PC cases. Many new models are designed to support water cooling and then designers keep maximum cooler height of 160mm. The NH-U14S is simply too big while the NH-U12S is just perfect and not so much worse if we look at the performance.